After reading thousands of comics and graphic novels for many decades, I find it hard to be blown away by a new work or creator. 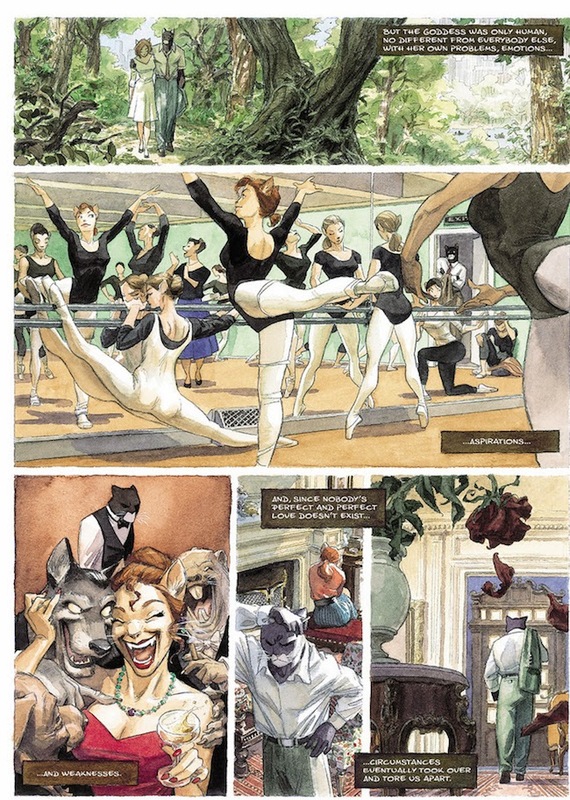 Fortunately I stumbled upon a pair of creators that many of you no doubt have been enjoying for a while: Blacksad by Juan Díaz Canales and Juanjo Guarnido. Blacksad ranks among the work of Will Eisner, Jim Steranko, and Frank Miller. Originally published in 3 different albums during the aughts, Dark Horse has assembled them in one big volume. These are three classic noir crime tales: one a whodunit about a former lover who was murdered; the second one about a racist southern town and a missing girl; the third one about the Red scare. It all takes place during the 1950s, but there is one catch: all the "people" are animals! Blacksad is a 6 foot tall black cat in a nice suit, but he acts like Robert Mitchum. The other characters include anthropomorphic dogs, lizards, crocodiles, even polar bears. The art style is beautiful, not "funny animal" style, but much more like the film version of LA Confidential. Both of the creators worked for Disney in France and were expert in creating storyboards - that discipline shows in each and every page. Muted colors, perfectly framed and composed shots - if you have the right imagination you will see these characters actually move. Jim Steranko, who does the introduction to this volume, is a big fan - as well as Neal Adams. Don't balk at getting the hardcover edition or paying $30, it is worth the price. Nuff Said!